The mechanism and keys are removed, pinned sections are broken down, and lubricated. Pins are replaced as necessary. Mechanism is then cleaned out and polished. Keys are swaged as necessary to remove excess side play and slop within a section. Pivot screws and pivot joints are cleaned and refitted to remove section side- play and wobble. Springs are removed, so the body can be worked on, bad springs are replaced. Soldered tone holes are checked for integrity, and re-soldered if necessary. Extruded tone holes are checked . Tone holes are put into round as needed and their surfaces are checked to make sure they are perfectly flat, with no burrs or sharp edges. Key cups are checked for roundness and bowing. If bowed, they are re-shaped and centered over their tone holes . Pad screws and washers and grommets for open hole are checked for integrity and flatness so that a leak cannot develop under a pad. They are cleaned, polished, refitted and replaced as needed. All key corks, felts and shaped corks are replaced. [ Shaped corks are the trill keys, and D# or Eb on the foot joint.] They require special care as to lever bottoming height /spacing and height at rest. Head joint cork is replaced, fitted, secured, so that a baffle or chamber leak cannot occur. Then it is greased / waxed and set to temper octaves. Crown is secured. Springs are re-installed, and tension is adjusted for a light, snappy and balanced action . Body is cleaned, polished and straightened if necessary. Tenons are re-fitted. All pads are replaced, shimmed flat, and to a uniform height out of the key cup ... approximately .014”. Pads are given a suction test to insure integrity. Mechanism is re-installed, coverage is adjusted, and pads are seated. Height of action [venting] is set. Mechanism is regulated, and lost motion is eliminated. A final check of coverage with a feeler gauge, and the instrument is ready to be test played. 1.] I shape & taper [ "SHAPER" ] the cork a bit before installing as it needs to follow the taper of the HJ to relieve any stress. It facilitates the ability of the HJ to resonate. 2.] Drop the cork into the head joint, it should stop with the [approximate] center of body of the cork in the center of the embouchure. 3.] I treat the cork with a cork grease I make from Paraffin wax, vegetable shortening and Vaseline petroleum jelly [generic] melted together... still refining the proportions of the formula. I also add a little [about 1 %] salvaged bee's wax from the rind of cheeses like Gouda & Edam. It adds a pinkish tint. After application I heat the cork & "grease" with an open flame [ trying not to let anything burn.] to make the cork pores open and absorb a bit of the wax. This makes the cork water resistant, eases fit and installation & helps prevent mold, mildew, water damage, and premature shrinkage. The cork in my Powell was replaced 18 years ago. I check it periodically and retreat as needed. 4.] The crown needs to be secured: I Place a small drop of hot [very HOT] glue on a piece of wire & apply IN the screw thread of the crown. It will prevent spontaneous unscrewing & potential loss,... it also keeps it from rattling & buzzing. ALSO... VERY important: The crown must not be too tight against the sides of the tubing... this is so the HJ [again] can VIBRATE & RESONATE. I have had customers come in with HJ corks & crowns too tight, and have the instrument playing "tubby". "Shapering" the cork and relieving the crown has worked more than wonders. It is something a lot of repair techs & some flute makers don't seem to understand or take seriously. The WEIGHT of the crown will change response as well. MORE WEIGHT = DARKER, LESS WEIGHT = BRIGHTER. Brad Garner adds a machine nut to the bottom of crowns [& those of his students] with epoxy putty. If the low and high octaves are not in tune, you must accommodate. If the high register is flat the cork has to come in farther [towards the flute body.] if it is sharp, screw the crown down a bit, and take it farther "north" towards the end of the HJ above the lip plate. Do so about a millimeter at a time until you find your sweet spot. To schedule an appointment, see our address & email above. 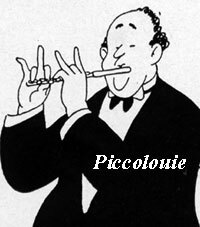 Call for a Repair Estimate for Your Flute or Piccolo Today!